It's time for the big reveal! Time to share the goodies received during Stephanie's 9th Teacup and Mug Exchange. This lovely lady puts so much work and effort into making this a wonderful exchange for so many of us; I think I saw somewhere there were 198 participants worldwide. Thank you, dear Stephanie, for blessing us with this fun time, and for helping us all to meet new friends. I got a beautiful package from Cynthia at View from a Garden. She's got me all figured out, with my love of pink and feminine and girly details. 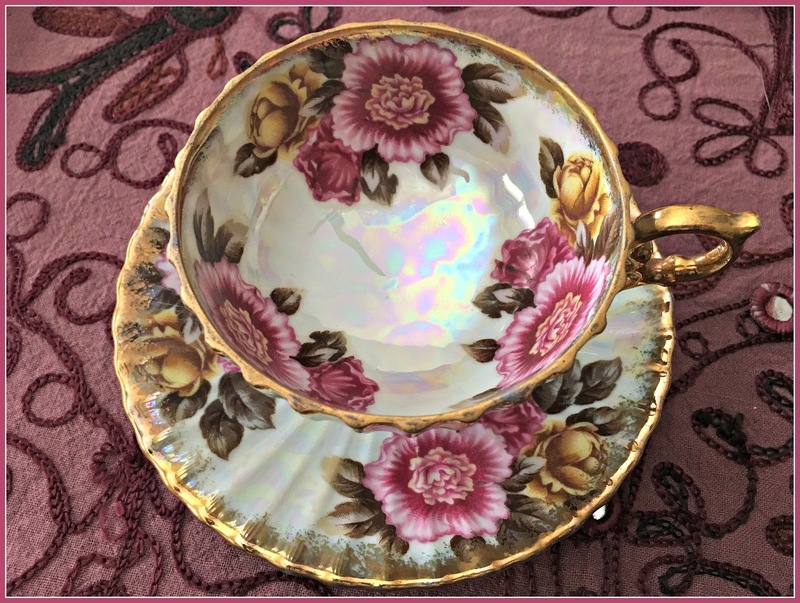 First, the beautiful pearlescent teacup in shades of pink and gold. Isn't it gorgeous? 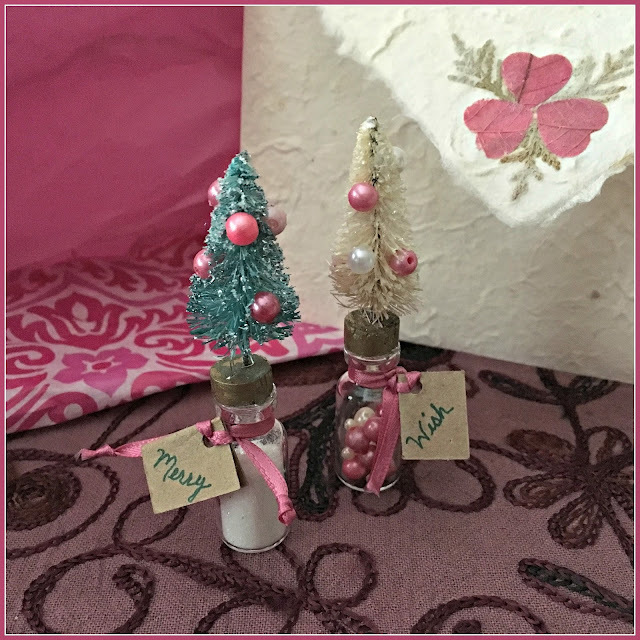 Two adorable little Christmas trees, made by Cynthia. Love those pink and white pearls! 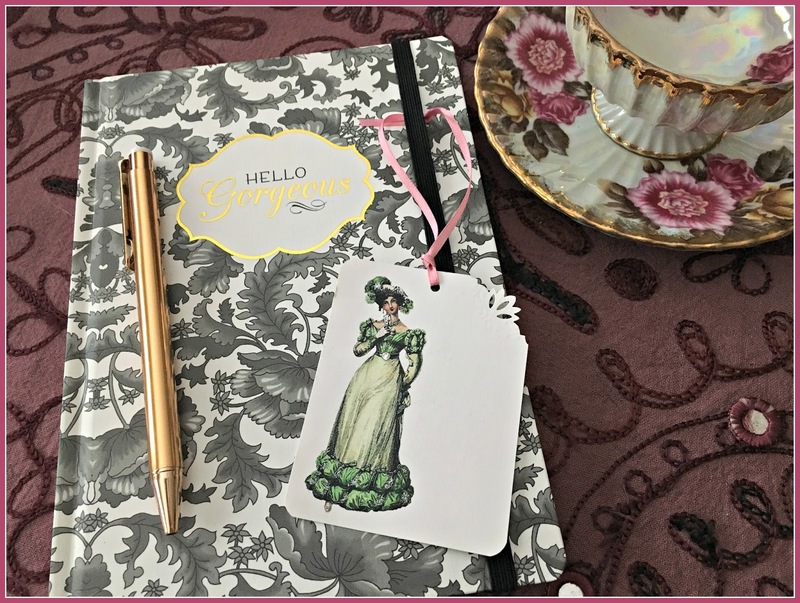 A fun notebook, pen, and bookmark. And some lovely smelling tea, blended by a friend of hers, and perfect for sleep. Thank you, Cynthia, for remembering my sleep issues. This will make the perfect relaxing cup of before-bed tea. Pretty handmade note paper and envelope. Thank you so much Cynthia. I will enjoy each and every one of these treasures. 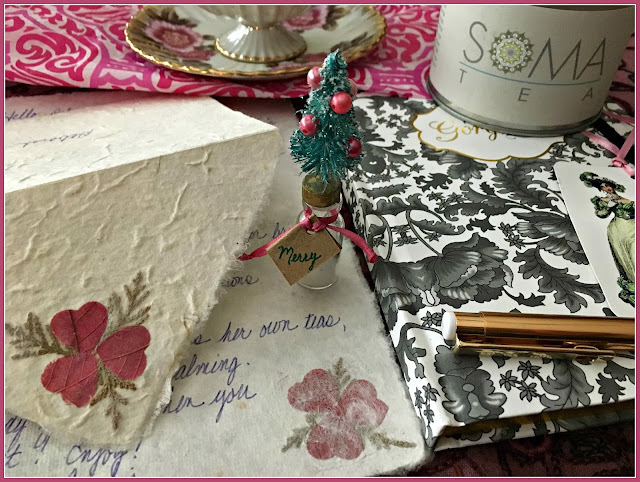 I had the privilege of sending a package to Kim at Wisdom With Needle and Thread. Love this shade of blue. After I took the pictures above, I realized one of the vintage handkerchiefs had a frayed edge. So I swapped it out for this pretty one. Be sure to visit all the other participants in this exchange by visiting Stephanie at The Enchanting Rose. Oh Deborah, where do I begin?! Your post was a feast for my eyes. 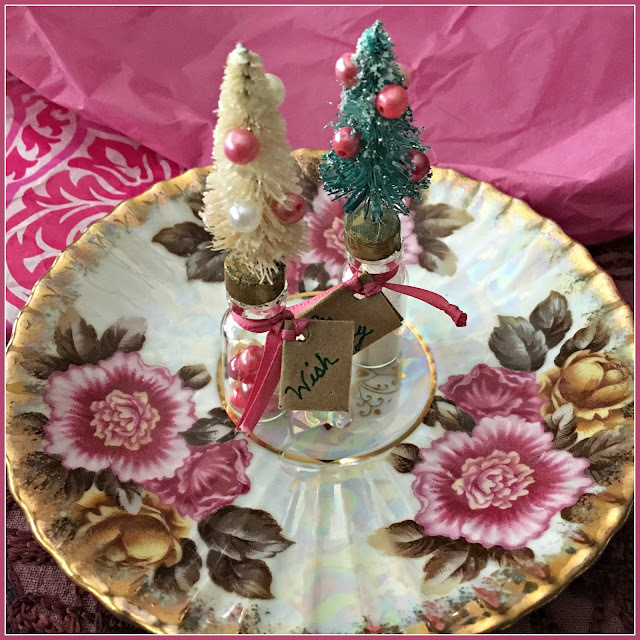 The tea cup you received is ever so beautiful and the Christmas trees are just darling! How thoughtful and kind of Cynthia to remember your sleeping issues. You were richly blessed, my friend. I am in love with the tea cup you sent to Kim. The shade of blue is indeed lovely. The extras you included no doubt brought a smile to Kim's face. Thank you, dearest friend, for participating in this beloved event. I greatly appreciate you and your loving words. Hugs! Both of these tea cups are so, so pretty! The one you received from Cynthia is lovely. I love the pink and gold combination, as you know! 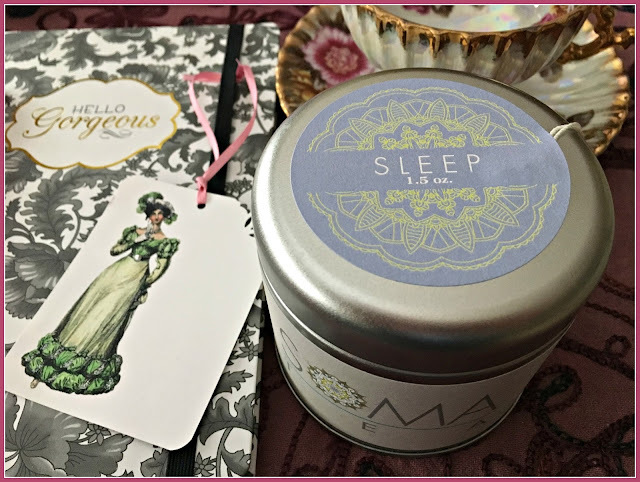 I hope the tea helps put you to sleep--such thoughtfulness in choosing just the right kind of tea for you. The other items are so nice as well. The tea cup you sent is so unique.I love that pretty shade of blue too and the flowers inside the cup are so sweet! I agree that Stephanie puts a lot of time and energy into providing this enjoyment for us! We are blessed by her presence, no doubt about it! Enjoy your treasures Debbie! I really love all of this event...it's a win win and a bow to how creative and thoughtful bloggers are. I'm so happy you were a part of it, Deborah, and could share. You received so many beautiful treasures! So fun! That is one gorgeous tea cup and saucer! You gals go all out for these fun exchanges. 198? That is incredible. Stephanie is quite the organizer. Gorgeous! That tea cup is as beautiful as you yourself, Deborah. 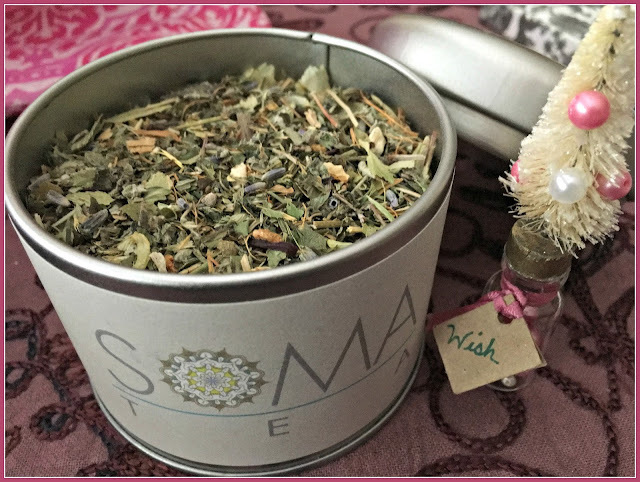 I pray that your sleeping tea helps you, what a thoughtful gift. The tea cup you sent out is quite pretty and dressed with some beautiful gifts. The perfect tea mix for you, how thoughtful. A wonderful exchange of beautiful and generous gifts. Beautiful gifts, both received and given! Oh, what a lovely exchange! Just a pure delight to see your beautiful things...both what you sent and what you received! Thank you for sharing, and may God abundantly bless you...and sweet Stephanie for all she does to make this possible for us! The teacup is so very pretty. I love the various shades of pink on it, and inside the whole package! What a beautiful post! All of these treasures just for you. Making new friends and meeting new bloggers put the cherry on top! Have a lovely, tea filled week! I am in love with your pearlescent tea cup, it is simply gorgeous! And the handmade Christmas trees, so unique and beautiful! And thoughtful to receive some tea to help with sleeping... oh isn't is just a delight to be so blessed in this tea party exchange, I am just feeling joy beyond measure as I visit each blog and see the delights that blessed the hearts of each one. Happy Tea Partying! Oh my golly, Deb, what lovely treasures! WOW! I think that teacup is breath-taking! And the Christmas tree ornaments she made are heavenly! What a blessing! I'm so happy that you like the teacup, Deborah! And what lovelies you sent to Kim. The hankies are so pretty. . .especially that last one with the awesome crocheted edge. Wish I knew how to do that. What a fun time this has been. Ah Deborah - a big smile from me as 'pink and girly' certainly does describe you. 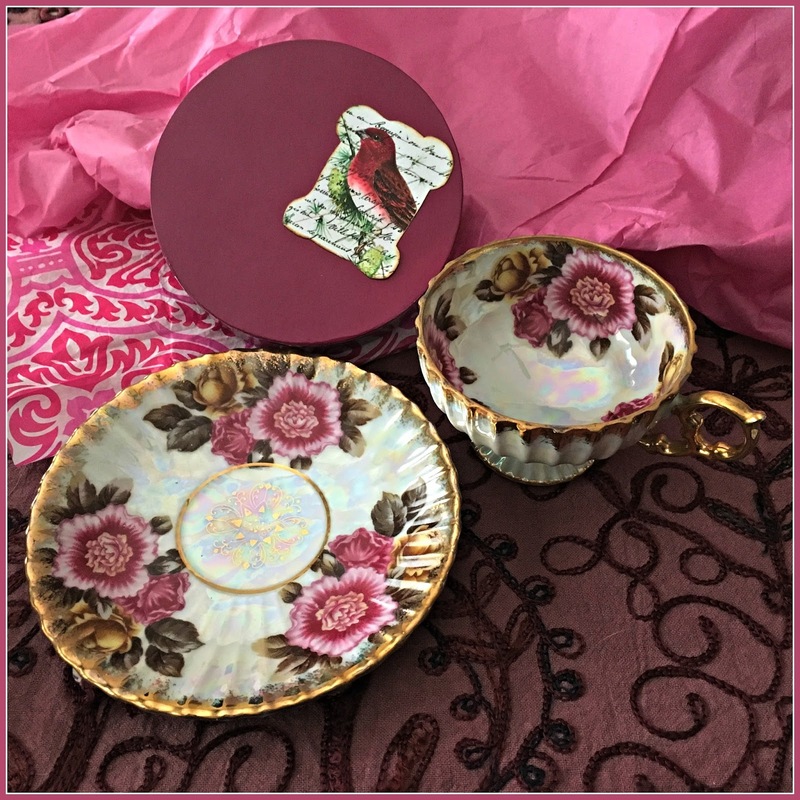 Cynthia sent you a lovely parcel, love the teacup with the bold pink flowers. Oh Deborah you received such a beautiful teacup! All these gifts from Cynthia are such treasures, and so beautifully packaged :) I love that handmade paper & card, so delicate. The teacup you sent along to Kim is so pretty too. Such fun all round!! 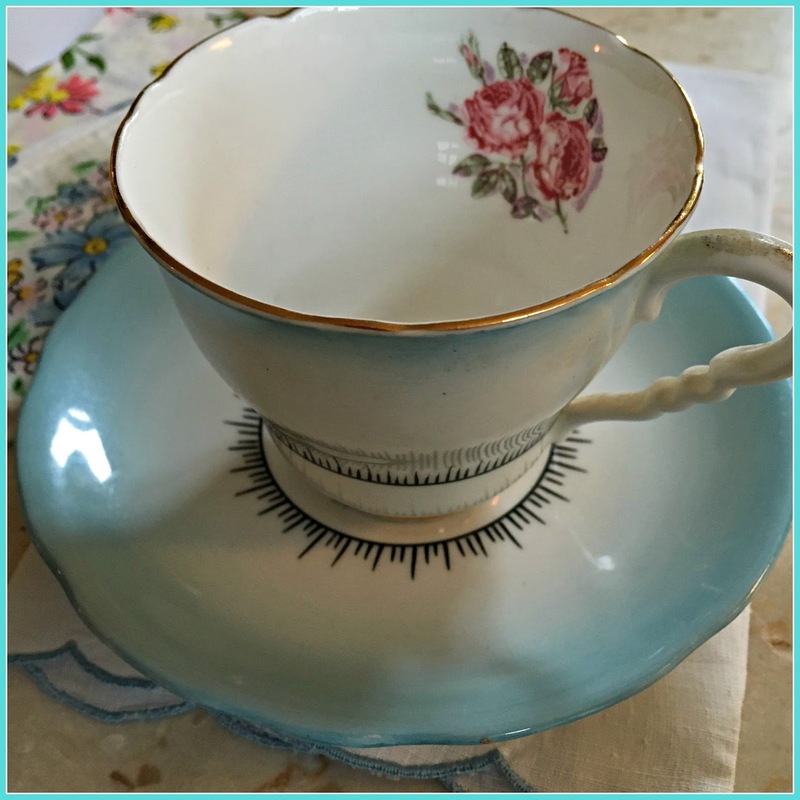 Oh my...what a stunning teacup and saucer! You certainly did great job capturing the pearlescent effect in your photos too! Everything she sent to is just so beautiful...and the package you sent out was as well. 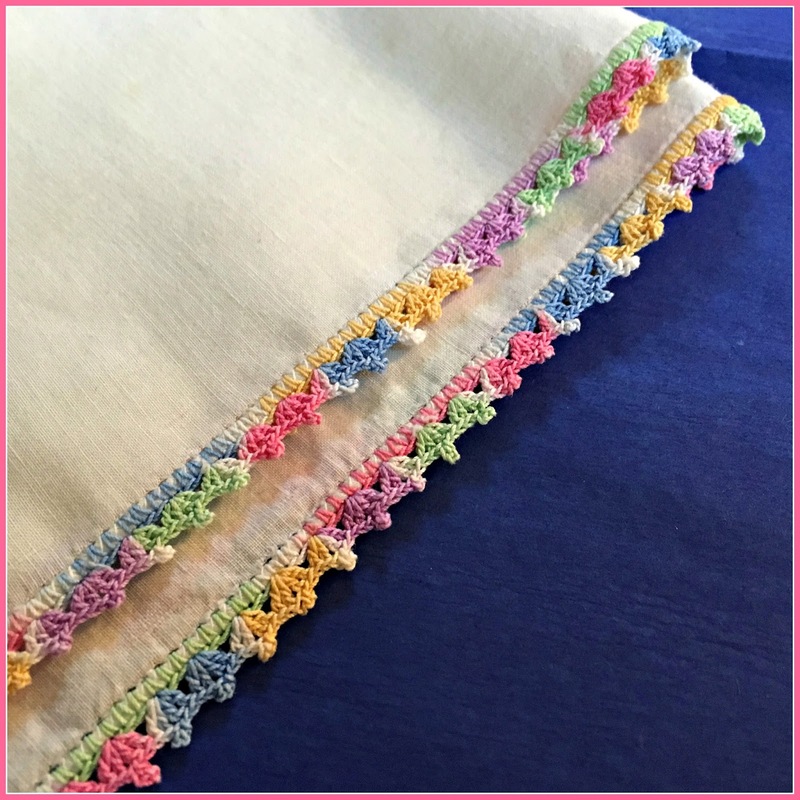 Oh...those vintage linens...be still my heart! Just remember this Deb, if you ever get my name on one of these exchanges, I LOVE VINTAGE LINENS TOO :) LOL! The teacup that you received is gorgeous! I've always liked iridescent teawares. The adorable Christmas ornaments are putting me in the mood for the holidays. The blue-themed package that you sent to Kim is also lovely! Those teacups are so nice. I know you both were thrilled to receive your packages. Your very feminine gifts are just so very pretty. I love the goodies your received. The tea looks yummy and the tea cup is beautiful. Such fun. What a beautiful teacup you received from Cynthia, Deborah, along with those darling trees and the wonderful tea for sleep. Your teacup that you sent to Kim was so pretty, and yes, that shade of blue is lovely, indeed! You certainly gifted her with such beautiful things. Isn't this the most fun?! Our dear friend, Stephanie is such an angel to bless us all by coordinating this biannual event. Love and hugs to you! Such a lovely post filled with beautiful pretties. I love all the lovely gifts you received. Such a pretty tea cup; you will have many enjoyable moments drinking from this pretty. LOVE all the pretties you gifted Kim. Everything is so pretty and blue. Oh my dear Deborah, your goodies are so pretty. That tea cup is gorgeous and the little Christmas trees are the sweetest. I also liked the fact that Cynthia remembered your sleeping difficulties. What a thoughtful gift. Your gifts for Kim were equally lovely. 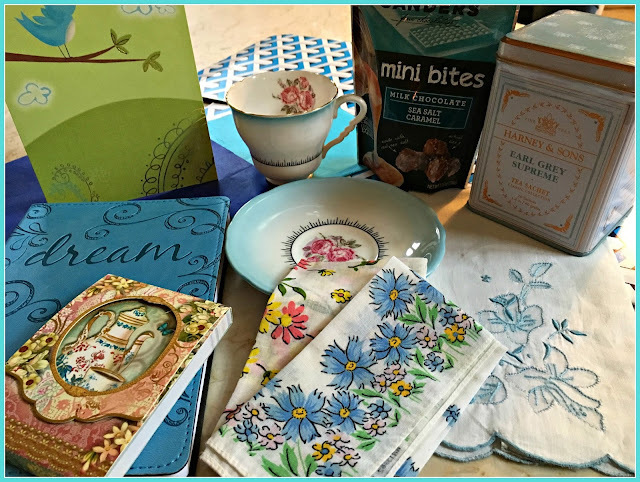 We are so lucky to have Stephanie organize this incredible tea cup exchange. She is such a kind heart. I just visited a post on this at Flower Lady's blog. You girls sure do things right! Those adorable tiny Christmas trees! Looks like you both received and sent some lovelies!